From one of the top-selling Buddhist authors in the United States, with over 2 million copies of his books sold, Work contributes to new models of leadership and doing business. It is also a book full of life-coaching advice, tips for finding happiness, and positive psychology. Chapters include dealing with workplace scenarios, dealing with home and family, encounters with strangers and with daily life, transportation, and creating communities wherever you are. This book is designed for adults who are new to meditation as well as those who are more experienced. By carefully examining our everyday choices we can move in the direction of right livelihood by building mindful communities, learning about compassionate living, or by coming to understand the concept of “Buddha nature.” A new wording of the Five Mindfulness Trainings is also included. "Work is a practical handbook for those who seek sanity and serenity at work. I love the beautiful simplicity of his teachings and the clarity they produce in my mind." "Thich Nhat Hanh has invited the world into mindfulness for generations. His latest gift is a call to return to the moment at work and throughout the day. Work gives us an opening into the happiness available in the here and now. Others may lecture, others may advise; Thich Nhat Hanh invites. I am grateful; you will be as well." -Franz Metcalf, author of What Would Buddha Do ? In Work, Thich Nhat Hanh, one of the top-selling Buddhist authors in the United States, adapts ancient Buddhist practices to modern life and helps readers make fulfilling choices about livelihood and ethical work. 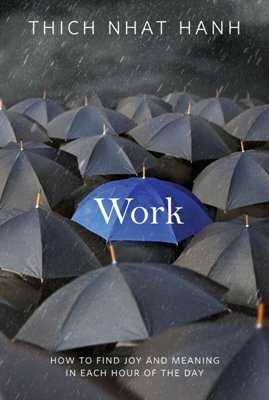 Full of life-coaching advice, tips for dealing with workplace scenarios, finding happiness, and positive psychology, Work suggests new mindful models of leadership and encourages us to carefully examine our everyday choices, so we can contribute to a work environment free from stress and tension, regardless of the circumstances. Thich Nhat Hanh is one of the best-known Zen Buddhist teachers in the world today. His best-selling books, including Power and Peace Is Every Step, have sold over two million copies in the US alone. He lives in Plum Village, in southwest France, where he gardens, writes, and teaches on the art of mindful living.